Rolling, the best way to deflect bullets. Mojang can do more than just make Minecraft, you know. The studio that Notch built signed on to publish several titles before Microsoft swooped in with the big bucks. One of those titles is Cobalt, a multiplayer combat game developed by Oxeye Game Studio, and it'll be ready for release in just a few weeks! Cobalt is a game about bullet deflecting rolls, location sensitive slow motion, and speedy multiplayer mayhem. The 2D battler has an eight hour campaign mode that pits you against the baddies, or you can indulge in a variety of multiplayer modes designed for short rounds and instant gratification. Either way, co-op is part of the package, as are 80 unique maps, 67 weapons, and dance-based mini-games! 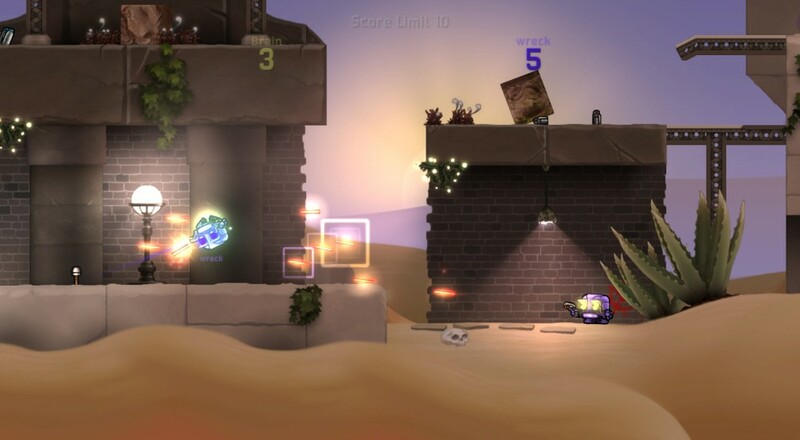 Apart from its "signature roll", Cobalt's big draw is a wide variety of multiplayer modes. Plug Slam puts you in an arena with an opponent to play a little 2D soccer with a gigantic plug. Survival mode is you versus waves of enemies, allowing for some extreme co-op action as you collectively fight for survival. Combat and Speed challenges throw tasks your way to see how good you are at Cobalting. Team Strike nixes respawns and sends you through multiple rounds of fighting to see how long you can survive. And then there's the good old fashioned deathmatch mode for pure free-for-all action. Cobalt is scheduled for release on Xbox One, Xbox 360, and Steam February 2nd 2016. Campaign mode supports two local players, but online survival co-op is playable online with a larger roster. Page created in 1.2057 seconds.